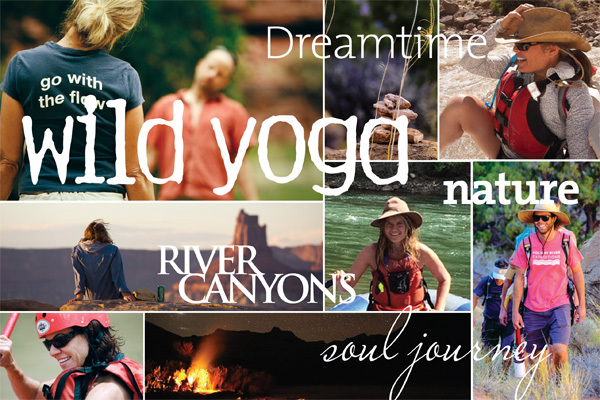 Green River Rafting and Yoga Through Desolation Canyon / Wild Yoga! 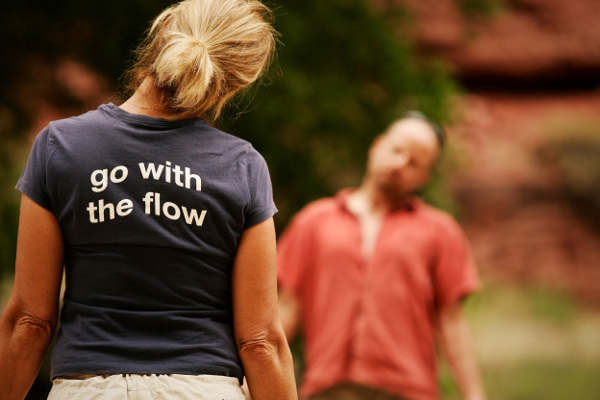 A journey for the soul that combines yoga, dreamwork, conversations with the more-than-human world, deep imagination, and a week-long Green River yoga and rafting trip through Desolation Canyon. The soul yearns to hear the river's song. The river calls us to listen, be present, and let go. Floating on a river invites a primal connection with the Earth and with our bodies. Wild Yoga is an alignment of Earth and soul, an immersion in sacred ceremony and deep listening. What will stir in your imagination, living on the Green River as it flows through the majestic red rock canyon, past hidden valleys, sparkling streams, and ancient relics? Earth is always dreaming and inviting us to dream, too. Surrender to the mysteries of your dreams, and wade into the currents of your deepest longings. Allow nature to inspire your movement. Shift consciousness through ceremony and conversation with the natural world. Discover the larger mythic potential of your life. 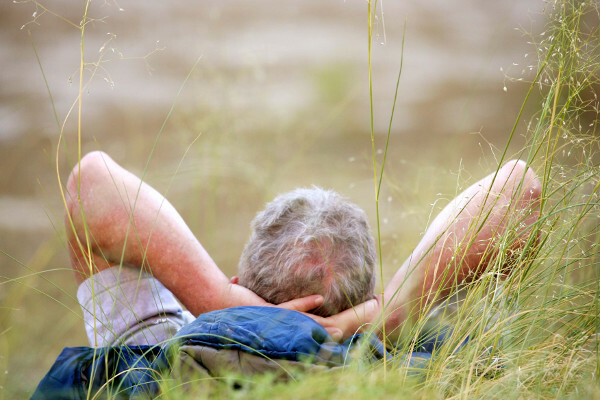 On this 6-day journey, you’ll awaken your wild animal body in the presence and wisdom of river and canyon, open to non-ordinary ways of perceiving, and surrender to your own particular way of belonging to the world. We are the ones we've been waiting for!" Join us as we deepen into river consciousness and our own unfolding soul stories! Rebecca Wildbear is a river and soul guide who supports individuals as they discover and manifest their truest gifts. She guides people in opening their sensory bodies, engaging their dreamworld, and accessing their deep imagination. She utilizes her training and experience with yoga, Hakomi, and somatic psychotherapy as she supports people in listening to the mysteries that live within their own bodies and within the animate natural world. A therapist and wilderness guide since 1997. 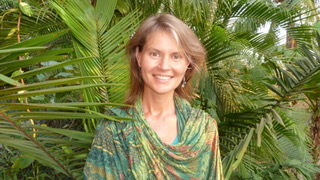 Rebecca guides with Animas Valley Institute, www.animas.org, and is the creator of Wild Yoga™, a sacred way of breathing and moving, aligned with Earth and Soul, www.rebeccawildbear.com. *$35 BLM Fees per person. Your adventure begins with a scenic flight in a small airplane as you fly north along the river corridor from Green River, Utah, to the Sand Wash boat ramp, in the center of the Tavaputs Plateau. Once on the river, you'll float for 84 miles through the largest remaining roadless area in the lower 48. The trip ends just north of the town of Green River, Utah. River trips are changeable by nature. It's why Holiday's motto is "Go With the Flow"! The itinerary of each trip we run can change depending on weather, the interests of our passengers, campsite availability, and countless other variables. Below is a sample itinerary of what a six-day Wild Yoga trip through Desolation Canyon could include. 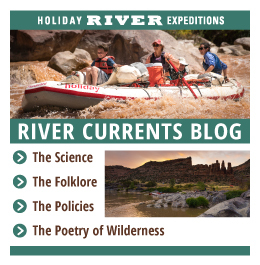 Our journey will encompass six days and five nights of rafting down the Green River as it flows through the remote and wild Desolation and Gray canyons. Rich in archaeology and more recent history, these canyons have been home to many different cultures and people for more than one thousand years. The geologic history is also apparent in the massive, multi-colored cliffs that rise rapidly as you travel downstream. Arrive in Green River, Utah, on the Sunday evening before your trip for an 8:00 p.m. Mountain Time pre-trip meeting. You’ll receive waterproof bags and have time for any last minute questions or purchases (see our packing checklist page for a list of items at our store). We'll also let you know what time to return in the morning to be on time for your flight. Special note: due to weight and space limitations on the aircraft, please bring any extra heavy or bulky items (especially personal drinks such as canned beer, boxed wine, or special sodas) to the warehouse by 2:00 p.m. the day before the trip. Please be prompt on Monday morning. We'll load your bags into a van and drive you to the Green River airport and send you up for an eagle's view of the canyons as you fly on a small aircraft to Sand Wash. A 45-minute hike downhill from the rim of the canyon will take you to the rafts waiting at the river bottom. (If you prefer, you can be transported by vehicle to the river.) Our first day on the river is gentle, mostly flat water. It’s a great day to try out an inflatable kayak. It’s likely we’ll camp that night in a cottonwood grove. Each morning, we’ll begin with a gentle but invigorating 60-minute yoga asana practice before breakfast. Wild Yoga welcomes all levels of ability. A vinyasa flow (or series of poses) will be offered. Each person's practice becomes individualized as they are encouraged to listen to the particular way their body wants to move. For more information on Wild Yoga, visit www.rebeccawildbear.com and watch a video. Days 2–6 will be interspersed with sections of playful whitewater. 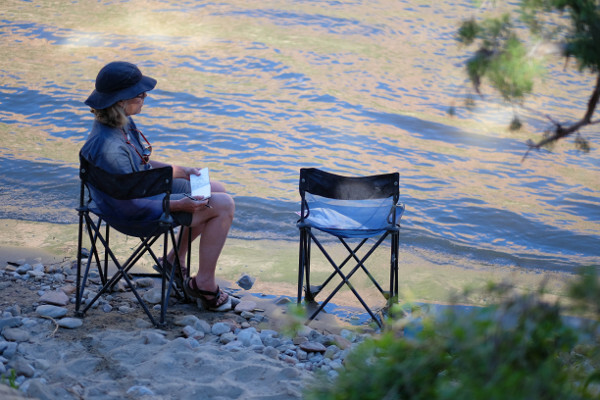 Each afternoon, we’ll arrive at a new campsite with time for hiking, swimming, or napping in the shade. We may tour ancient Fremont cultural sites or the abandoned Rock Creek Ranch, where Butch Cassidy's Wild Bunch slept. The Green River will carry us into the heart of red rock country, where giant, ancient walls encircle us. Here, we’ll be engaged in ceremony, wanders in nature, dreamwork, and deep listening. 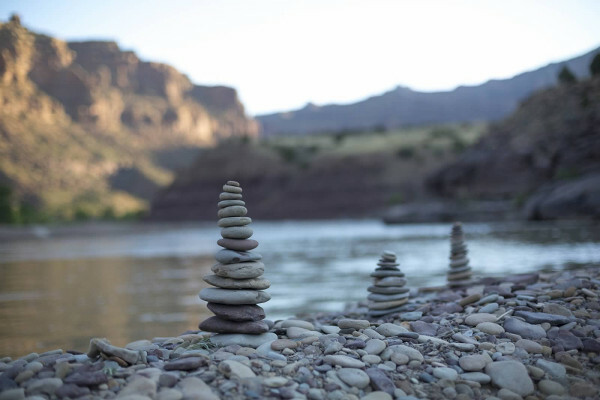 Enter into a love affair with yourself as you float through this magnificent river canyon and root yourself in a relationship with the animate natural world. Discover life-altering glimmers of your greater purpose, your unique artistry, and your role in the larger Earth community. Through a variety of modalities, we will open our sensory body, explore our dreams, and listen deeply. We'll engage in ceremony, council, creative movement, conversations with the more-than-human world, and soul poetry. On Saturday, Day 6, we’ll take out near Swasey's Beach and return to Green River, Utah (20-minute van ride). Our expected time of arrival back at our headquarters is between 3:00 and 4:00 p.m. This is a sample itinerary intended to give an idea of what the trip will be like. Our plans are ever-changing, however—like the river itself. The time spent on the river in Desolation Canyon was magical. Rebecca, Erica and Jacqueline guided us on an adventure through the canyon and river that was so beautiful! And Rebecca shared with us an additional inner journey through nature and yoga that made me feel connected to life and nature on a more intimate level. Thanks Rebecca! Looking forward to our next adventure. winding down this ancient waterway, connecting with the wild space within and out. 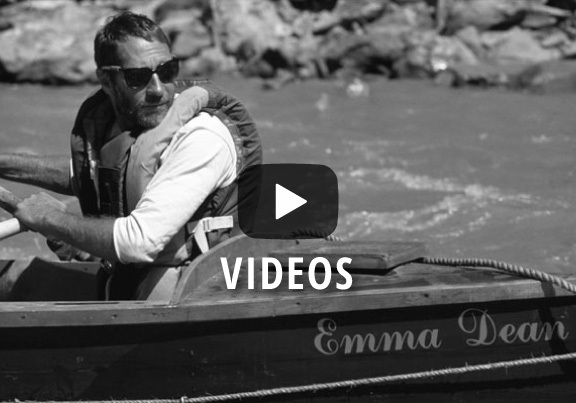 this is the most soulful, beautiful way to immerse yourself on both the outer journey down the river and the journey we are all on within. connecting to both those spaces and really using your all your senses to be present on the path. it is easy to find yourself so completely in this space because rebecca wildbear has such a beautiful skill to guide you on this journey. this trip was invigorating, opened my heart to land and the people I was sharing it with. there is nothing quite as magical as following the veins of a river and watching as the landscape unfolds and changes at every bend. yoga, hiking, ceremony, and cracking that shell open that holds you in. I urge you to listen to that which is calling you to join in the river song. the food was amazing and holiday did an exceptional job catering to my dietary needs being gluten free/vegetarian. the guides were excellent and felt more like friends on the journey than guides which made this a very pleasant experience for me. ahh....take me back! Loved this trip, Its a rare occasion when Im able to enjoy so many of my passions in one experience, In this white water rafting and yoga wilderness adventure, Rebecca Wildbear's unique river and soul guiding expertise lead us safely down the green river helping us connect deeply with nature, each other and ourselves. Truly a rejuvenating joyful experience. Thank-you Rebecca! Don't miss this!